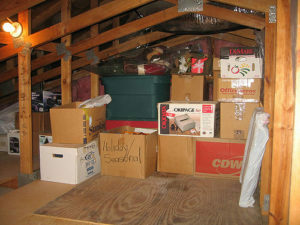 Attic clean out tips for space reclamation can really help out a whole lot. Few homeowners really think about their attics as truly useful spaces. Most tend to regard these spaces as dark, dingy places where old family heirlooms and season decorations reside year after year. But, an attic can serve an entirely different purpose. Imagine having a dedicated guest room suite where visitors have all the comforts of home. Or, use it as a place for one or more of your favorite hobbies. If you’ve always wanted a man cave, you can transform it into a getaway oasis, complete with a big screen TV. For kids, the attic can be a terrific playroom or a game room for older children and adults alike. Identify everything. Once you have an unobstructed way to walk to an from the attic, it’s time to identify everything that’s stored in the space. This will constitute the bulk of your efforts and take the most time. Label all boxes with contents so you know what’s inside and where. Remove all the junk. Now, it’s much easier to purge the junk from the rest. If you don’t use it or don’t really need it any longer, just get rid of it and move onto the next item. Formulate a workable plan. Lastly, you’ll have to come up with a sensible, workable plan for the attic conversion. When it’s time to do an attic clean out, phone us at 800-433-1094 or visit Junk Garbage Removal.